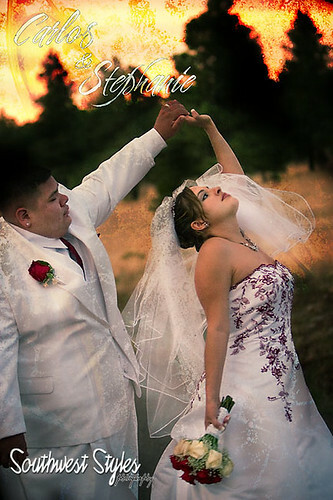 Carlos Stephanie Wedding Flagstaff Arizona Southwest Styles Photography, originally uploaded by swstyles. 15 degrees cooler in Flagstaff on June 31st. Carlos and Stephanie were a great couple to work with. I have worked with Carlos's family in the past and the whole gang was in attendance to celebrate their union. Please click on the picture to see more photos from this day. Hi Daniel, thanks for connecting with me Flickr. I'm sooooo elated by your work. Such a unique style and work of art. If you ever teach a workshop about what you do, I wanna be the first to sign up. How long have you been in business? And, any recommendations, tips, and ideas for how I can produce to kind of art that you do? I'll be visiting your blog often. Thanks so much posting your it. She is wearing a beautiful dress! I am also getting married by the end of this year in one of the Los Angeles event venues and I am a lot very excited for that. I am also looking for pretty gowns these days. Do share the place from where she got her wedding dress. It’s different!